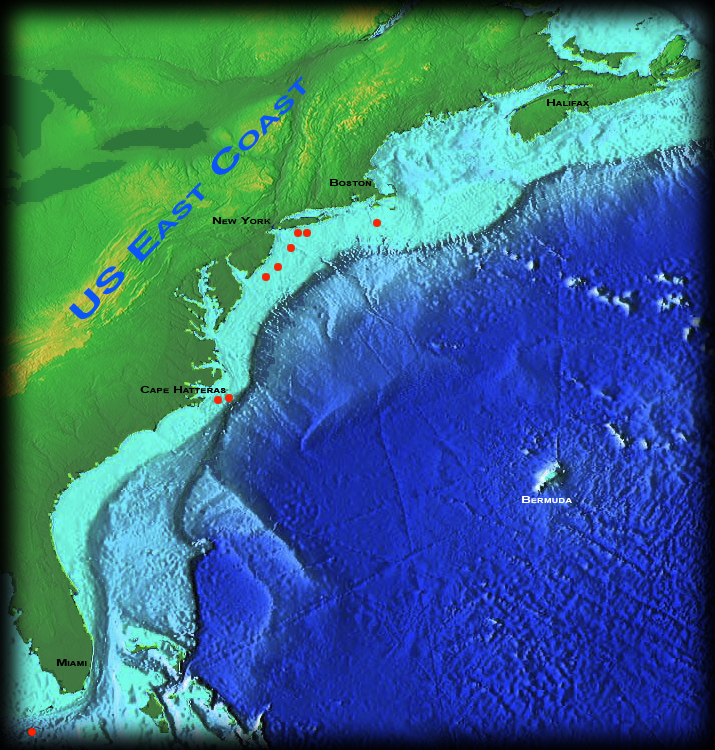 The ocean floor off the American East Coast is littered with shipwrecks. They lie scattered across the bottom like stones on a deserted beach, thickly concentrated in some places--outside major ports and off Cape Hatteras for instance, and thinly spread in other locales. While the tale of each shipwreck is an individual one, often distinctive in its own right, none are isolated events in history. Shipwrecks are invariably a reflection of the world from which they came, always affected by, and often affecting, the course of world events. In some cases, such as the Titanic or the Lustiania, a shipwreck literally changed the course of history. Like a yarn in the continuous fabric of history, each shipwreck is part of a much broader picture. The waters off the US East Coast are where I 'grew up' diving, so to speak, and first began taking underwater photographs. The pages below are intended to be a sort of visual dive log, and present some of my more recent photographs along this fantastic coast. I hope to keep these pages updated on a (reasonably) regular basis--when I have images that are worth sharing!